From The Poetry of Nizami Ganjavi: Knowledge, Love, and Rhetoric, ed. a Edited by Kamran Talattof and Jerome W. Clinton (New York: Palgrave, 2000). 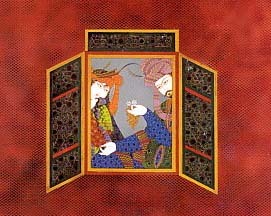 The work of Nizami Ganjavi, one of the great Persian poets, has achieved enduring significance. The five long poems, known collectively as the Khamsa (Quintet) or Panj Ganj (Five Treasures), composed by Nizami in the late twelfth century, set new standards in their own time for elegance of expression, richness of characterization, and narrative sophistication. A year does not go by without the publication of a new book or article about his poetry, and although he belongs to the classical period of Persian poetry, the interpretation of his work has fueled a cultural debate in Iran in recent years. For these reasons, a reexamination of Nizami's work would be important. The introduction to the book argues that more than jurisprudence issues or any other religious concern, Nizami was preoccupied with the art of speech itself. For him, the art of speech was the sublime. Furthermore, departing from a Manichaeist or Zoroastrian dichotomy of good vs. evil, he subverts the dichotomy of love and morality by presenting both as good. In addition to articles by the editors, the volume includes essays from prominent scholars of classical Persian literature. The articles included illustrate not only the great diversity of Nizami's ideas but also his underlying and overwhelming preoccupation with the art of speech. In "A Comparison of Nizami's Layli and Majnun and Shakespeare's Romeo and Juliet," Jerome W. Clinton draws attention to the very different approaches taken by Nizami and Shakespeare both to describing passionate love itself and to showing the impact of lovers on their communities. In "Layla Grows Up: Nizami's Layla and Majnun in the Turkish Manner," Walter Andrews and Mehmet Kalpakli argue that Fuzuli's Ottoman Turkish version of the story should be read as a revisionist interpretation of the legend that gives Layli new prominence. Kamran Talattof provides a comparative study of Nizami's work in his article, "Nizami's Unlikely Heroines: A Study of The Characterizations of Women in Classical Persian Literature," to further better understanding of the attitudes of Nizami, Firdawsi, and Jami toward issues of gender. Asghar Abu Gohrab in "Majnun's Image as a Serpent," argues that in contrast to the early Arabic sources that refer cryptically to Majnun's emaciated body and his nakedness, Nizami uses images of the serpent, among others, to depict Majnun's physical appearance and his complex character. Julie Scott Meisami devotes her paper, "The Historian and the Poet: Ravandi, Nizami, and the Rhetoric of History," to a discussion of Ravandi's use of quotations from Nizami in the Rahat al - sudur . J. Christoph Bürgel, in his article "Occult Sciences in the Iskandarnameh of Nizami," discusses Nizami's portrayal of an ideal statesman based on Farabi's concept of political philosophy. According to this book, in addition to military, political, philosophical, and prophetic faculties, a statesman should also understand, among others, astrology, alchemy and magic, and music and medicine-in other words, the three major branches of the so-called occult sciences. In "Nizami's Poetry versus Scientific Knowledge: The Case of the Pomegranate," Christine van Ruymbeke explains Nizami's knowledge of pharmaceutical and medical properties and uses by examining his remarks on certain plants. Firoozeh Khazrai, in "Sources of the Musical Sciences in Nizami's Work," propounds the belief that men of Nizami's stature were conversant in most of the sciences of their time, including music. She analyzes the story about Aristotle and Plato as a point of departure for speculating on some sources of the musical sciences of Nizami's day. In his article, "The Story of the Ascension (Me'Raj) In Nizami's Work," C.-H. De Fouchécour argues that Nizami has used traditional material belonging to the prevalent religious discourse of his time to create magnificent metaphorical expressions, entirely poetic and complex. Because of this literary richness, Nizami's work has invited numerous adaptations. Finally, the bibliography on Nizami's work will provide essential information about the translation and scholarship of Nizami's work in several Western and non-Western languages. 1- No exhaustive reckoning has ever been made of the poets in Persian, Turkish, Pashto, Kurdish, and Ordu (and other languages of the Persianate tradition) who emulated Nizami's example by imitation, but by all indications the figure must be staggering. The extraordinary dissemination of Nizami's panj ganj throughout Persian and Persianate literature is a remarkable and largely unexplored phenomenon (cf. Jalal Sattari, note 22 below, page 18). In the present volume J. S. Meisami opens up a new approach to this question by examining the impact of Nizami's poetry on the Iranian historian R?vand?. 2- E. G. Browne, A Literary History of Persia (Cambridge, 1964) vol. 2, p. 403.